So… have you seen these? 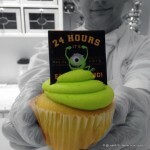 Clearly Disney is getting the idea about how much we love Disney Cupcakes! 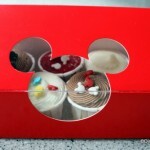 This “Character Cupcake – Mini-Pin Set” will be released on March 10, 2011, at Walt Disney World! 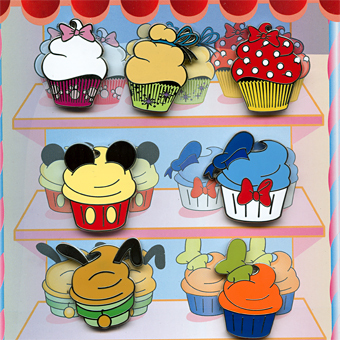 Retailing for $29.95, the set includes cupcakes reminiscent of Marie from Disney’s The Aristocats, Tinker Bell, Minnie Mouse, Mickey Mouse, Donald Duck, Pluto, and Goofy! More info on how to order the pins here! All information is subject to change including but not limited to artwork, release dates, edition sizes and retail prices. Thanks to Brooke F. and Cody S. for the heads up! Wow, quite the interesting Pin Set… and variety too! 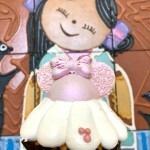 These are neat, but for some reason they didn’t make my stomach growl like the earlier cupcake post this week…. OMG, I want these! These are perfect for me, because I’m a baker who loves Disney! 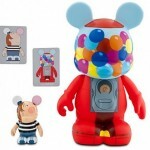 Will have to figure out a way to get them, because I can’t wait for my next trip! I’m not into the pin collecting except each trip we get one for the resort we stayed at – but those are wicked cute!